Symbid began as one of the first equity crowdfunding platforms worldwide and now offers multiple forms of corporate finance including bank loans, venture capital, angel investing and crowdfunding. The Funding Network™, in collaboration with its strategic partners, is on track for an expected transaction volume worth $800 million in 2015. 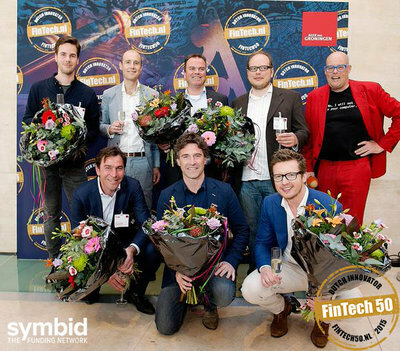 Co-founder and CCO Robin Slakhorst collected the award on behalf of Symbid as the most innovative and disruptive Dutch market player in SME finance. The Funding Network™ is a go-to platform for start-ups and small businesses in search of funding. Through advanced investing, monitoring and data tools Symbid is connecting traditional and alternative finance in a new, online model. With $68.5 million provided to small businesses via The Funding Network™ in its first 2 months, this award validates Symbid as a leading European player in financial technology. Although this funding volume does not currently equate to a significant revenue stream there is potential for a monthly recurring revenue model to be added in the near future.